This is a continuation of the last Indoor Champs post, but now- with pictures. As I started in the last post, what a good group of guys to throw with. I must say again- a big thanks to USATF and NIKE. What great supporters. Thanks for a great event. 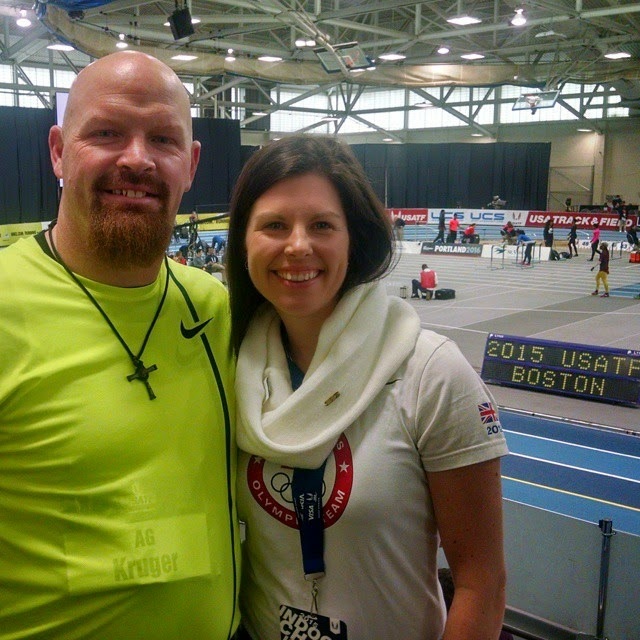 Labels: 2015 USA Indoor Championships, A.G.
Well, another Indoors done and I pulled off a win on the last throw. Fun, but nerve racking. Finally on the last throw I did not think about it and I just went out and threw what I have done all year long. It was a great group of guys to throw with- Kibwe back in indoors after a long absence, always Jake Freeman, and all the others... especially J.C. Lambert who really pushed me this year and had to make that throw on the last one to pull it off. 1. Never give up because after prelims I was sitting in 7th and I could have easily just given up and kept taking the beating I was getting, but I didn't. 2. I forget sometimes how long I have done this until people tell me and I realized Jud has told me 25 times to "go get it done" for USA Nationals. 3. How blessed God has given me this gift to do it this long and how great my family, wife- Laura, kids- Geo and Marina, parents- Al and Linda, and sisters- April and Angie, have supported me through the years when it has been tough, they have always been there. Jud Logan, my coach who has been there through this whole time. Ashland University Athletics, who has supported me throughout and works with my schedule and especially my boss, Al King. And then also the trainers and a special shout out to my man, Jeremy Hancock, for always treating me even if I did something stupid. Then there are the people like Dr. Tim Novelli, who has seen me for years to provide me with adjustments and chiropractic care to keep me at my best. Also NIKE who has now been my sponsor now since 2007 and had given me tremendous footwear and apparel through the years. Also to the athletes at Ashland University, especially the throwers that I work with and train with once and a while. But also the ones I coach as a strength coach that keep me in check as to what intensity is and keeps on reminding me how hard work pays off, at whatever age. I know that does not cover everyone but I want to thank everyone who has helped me out through the years. Also thank you to all that I have competed with and who I have learned so much about how to prepare and compete. It is a true blessing to say I can still win it at the age of 36 and I can say one thing- it will never get old.